I was again honored to appear as a guest chef at the UMASS campus this week for the 22nd Annual Tastes of the World Culinary Conference. This is a conference which is limited to 350 chefs from around the country that are in charge of college campus dining. College campus cuisine or restaurant dining, has become a very important part of college admission selections and is often the decision maker for parents sending their kids to school who want to know that their children will be eating healthy, nutritious foods during their tenure on campus. We all know that food can act like a powerful medicine that keeps us healthy or helps our body heal from sickness and disease, and even influences our moods. Beyond simply being a source of energy, good food is a source of special components, anti-oxidants and phytochemicals that can transform our health. Who among us has not benefited from a bowl of warm chicken soup when we are sick with a cold? Of course, if it was made especially for us with lots of love, it might help us get better even sooner than expected. Food has a powerful effect on our health and it rests on us as chefs to provide nourishment for our customers that will promote their good health. This is my favorite conference and although I speak at at least 6-8 events a year, this one has special meaning to me. Food is just one integral part of the reason I and the other incredible chefs from around the country participate. Issues such as sustainability, social responsibility, animal welfare, and where our food comes from, are all parts of the considerations at this event. The outcome could help revolutionize the American diet as it now stands. The food at UMASS is some of the finest in the country, and wins prestigious awards each year for its quality and social responsibility. 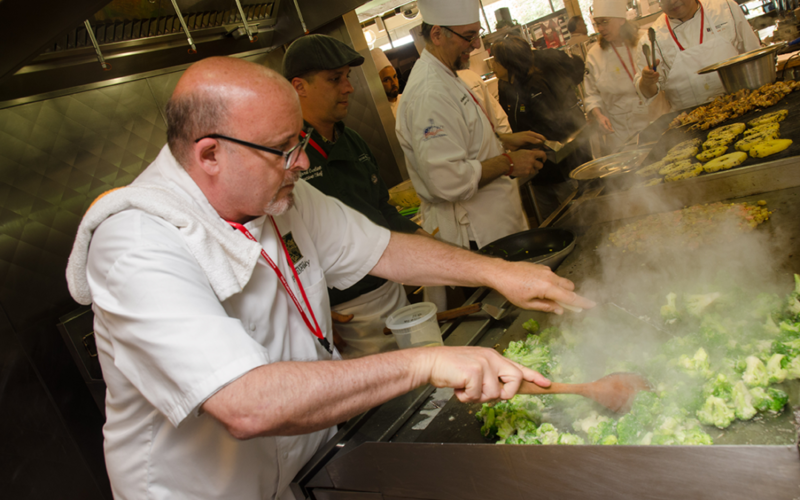 Participating in this event provides an opportunity to directly impact the food of 350 chefs that immediately take back the recipes and learning to their respective campus kitchens and spread the love and wisdom we have all shared together. The chefs who come, take the recipes back to their schools and create excitement, build community and change the way an entire generation of diners in search of something new, healthy and sustainable dine. I always leave this conference inspired and grateful, and in some small way, feel as if I contribute to the well being of our kids and their families. I wanted to share 2 of my favorite simple recipes with the expectation that it will do the same for you. Spicy Gochujang Salmon and Charred Lemongrass Broccoli are super easy and big on flavor. Gochujang chili paste can be found in every Asian grocer and on line. Same for Matcha green tea powder which is super popular with chefs around the country. Enjoy!